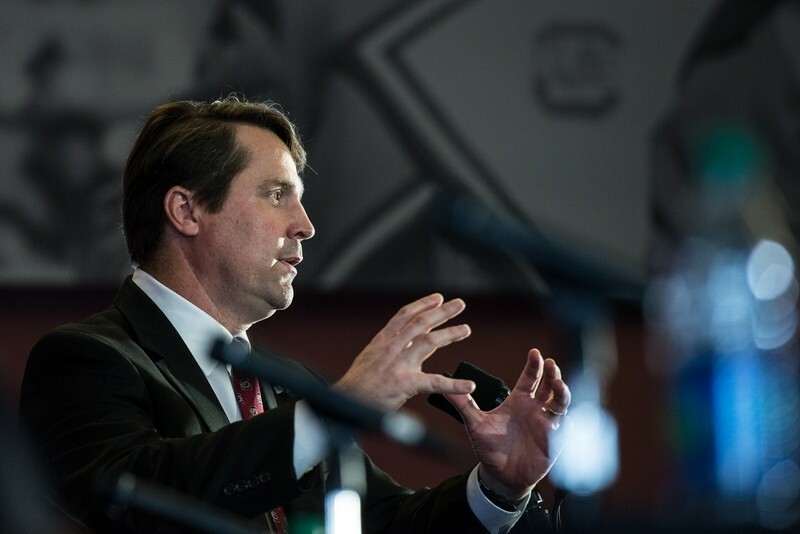 Will Muschamp comes to South Carolina riding a wave of mixed feelings based on past results. Muschamp was the head coach at Florida for 3 1/2 years, then was fired halfway through his fourth season. Defense was never a problem for Muschamp, leading the Gators to ranks of 12 (’10), 9 (’11), 6 (’12), and 5 (’13), but it was the lack of offensive production that was the ticket out of Gainesville for Muschamp. After spending a season as the DC at Auburn, he comes to Columbia with the task of vaulting the Gamecocks back to the SEC contenders they were in the early years of the Head Ball Coach era. Here are 5 stats that Muschamp must turn around in order to succeed in Columbia. In his 4 seasons with the Gators, Muschamp was downright awful in the red zone. In this day and age of college football, opportunities given must be taken advantage of. In 184 times in the red zone, the Florida offense scored a grand total of 96 times… barely over 50%. A 51.33% TD ratio doesn’t cut it in this era of the SEC. It’s not like he was just settling for the guaranteed field goal either. Florida only had a 77.39% success ratio in the red zone. They only got POINTS, let alone touchdowns, 3/4 of the time. Obviously Muschamp isn’t 100% to blame for this since he is a defensive coach, but he must be wise in who his coordinators are at South Carolina. Thankfully, an easier schedule against some of the softer defenses in the SEC should allow opportunities for this number to rise. Considering how bad USC was at passing the ball last season, any sort of turnaround must involve improvement in the passing game. For this to happen, Muschamp has to better his 178.1 passing yards per game mark from his years in Gainesville. His career mark at Florida was worse than the Gamecocks 207.5 passing yards per game last season. However, true freshman QB Brandon McIlwain is showing promise and could be a bright light for the future of the passing offense. Muschamp is also a very good recruiter, so if he is able to bring in some blue chip receivers to supplement this attack, the passing game could become dangerous within the next couple of years. To have any hope of beating the Clemsons, Georgias, or Tennessees, Muschamp’s 36.14% 3rd down conversion rate must be improved. This means becoming better on 1st and 2nd down so that the 3rd downs that do occur become more manageable and easier to convert. With a dual threat QB like McIlwain, hopefully defenses will be on their heels a little bit more on the 3rd and short situations and give up more first downs. When Florida had to face ranked teams with Muschamp at the helm, it normally didn’t turn out well. A big reason why Muschamp was shown the door out of Florida was the fact that he was 5-17 against ranked teams during his tenure. His offenses put up a meager 15.5 ppg gaining 260.5 ypg against ranked opponents. Even his defense couldn’t produce enough turnovers to account for the offenses’ carelessness with the ball, totaling a -22 turnover margin against ranked teams. If this stat doesn’t improve, I can’t see Muschamp lasting any longer than 5 years as the head coach of USC. If Muschamp can’t keep his team disciplined, it will be much harder to win games. Florida ranked dead last in the SEC by a long shot 4 straight years in number of penalties, penalty yards, and personal fouls when Muschamp was the coach. Will Muschamp has to do a better job of keeping his players disciplined because not only does it cause penalties if they aren’t, other things also happen. Like these two Florida linemen blocking each other. If I ever see two Gamecocks blocking each other against Clemson, I might cry. Please don’t make me cry coach. This article originally appeared on SB Nation. It has been republished with the author’s permission.